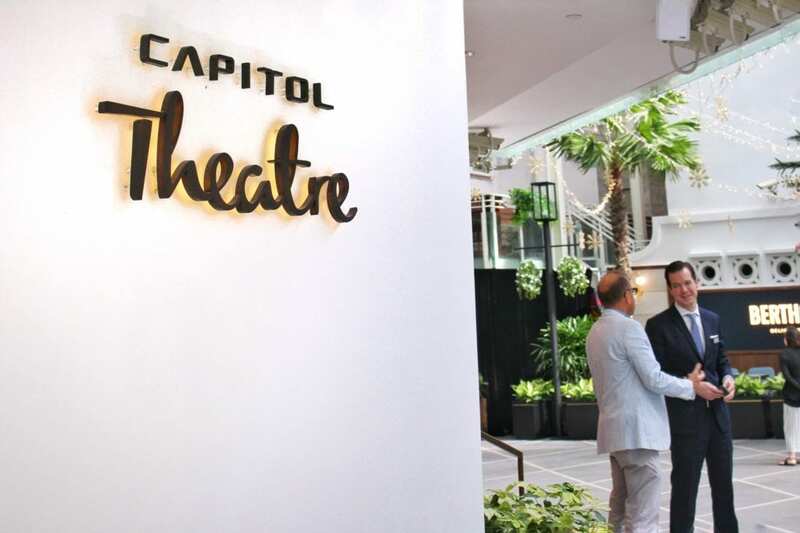 On the corner of Stamford Road and North Bridge Road, in the heart of Singapore’s civic and cultural district, lies the newly-renovated Capitol Theatre. It is an art-deco gem which began its life in 1930 and was designed by the neo-classical architects Keys and Dowdeswell, taking inspiration from the iconic Roxy theatre in New York. Locals old enough to remember, look back nostalgically to a time when stars such as Charlie Chaplin, Ava Gardner, and Douglas Fairbanks visited the theatre to promote their films. The Mickey Mouse Club hosted their shows there in the 1930s, and anyone in Singapore over the age of 70 will remember their first dates at the French pastry shop alongside the theatre. Now, this art deco icon has been revived as part of Capitol Singapore, the country’s first integrated lifestyle development. Designed by Pritzker Architecture’s award-winning architects, Richard Meier and Partners, the entire development comprises The Patina, a hotel; Eden Residences Capitol, a residential development; and Capitol Piazza, a retail food and beverage hub. The Capitol Theatre is the crown jewel of this destination. The hotel blends in perfectly with its surroundings as an art deco gem offering un-paralleled luxury, and all guest rooms are uniquely different from one another. High ceilings take one back to an era when space meant opulence. Real estate magnate, Pua Seck Guan, and his company Perennial Real Estate Holdings maintain control over the entire project which includes the theatre and hotel, and he is happy that the Capitol Kempinski is at long last receiving guests. “It could be better than Raffles,” he said. More than 15 chains bid for the management contract, but Pua had a penchant for Kempinski, Europe’s oldest luxury brand. The main rationale behind the Kempinski selection was that the chain focuses solely on luxury, avoiding the distraction of 3- and 4-star properties.